Marcel Breuer (1902-1981) was attracted to the year-old Weimar Bauhaus by its idealistic program that promised new approaches to art and architecture away from the iconoclastic methods of the past. The 18-year-old from Pecs Hungary, demonstrated an extraordinary talent and energy in the Vorkus and workshops. In the spring of 1924, Marcel Breuer, with the advice of Georg Muche, began a collaborative work group to study housing and particularly high-rise structures. Marcel Breuer produced a design for a seven-story apartment block that would become a prototype. One of the first to complete his diploma requirements, Marcel Breuer became young master when the school moved to Dessau in 1925. 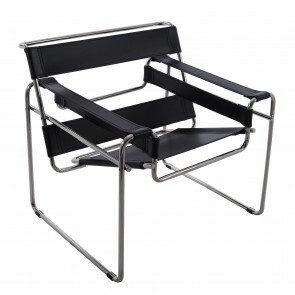 It was during those years that Marcel Breuer created his famed Wassily steel and leather sling chair and other innovative furniture designs; Marcel Breuer was then in charge of the furniture workshop.